RoCkaNdFRoCk: ( BaBy ) BLuE iS ThE NeW HuE. Every season it's really a pleasure to sneak a peek of the Pantone's Colors Palette…for next Spring baby blue will be the king!!!!!!!! 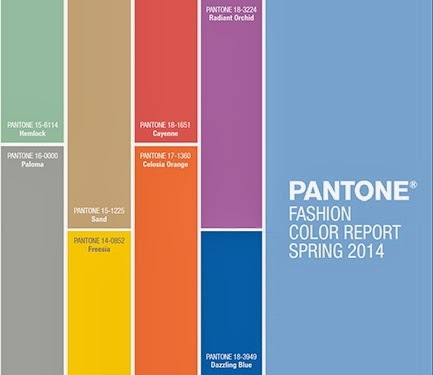 I'm very happy of it as it's a color that I like & that I've haven't worn for sooo long…then - still present - a nice electric blue, and some vitaminic hues like a bright orange & my beloved RoCkaNdFRoCk yellow…There's just one shade missing in this palette: pink! ( that will become quite an obsession… ) Happy Thursday!!!!!!!!!!!!!! Love all these colours & so pleased to see cobalt is still around! Mi piace proprio questa palette, poi come te adoro il giallo! Non c'è niente da fare, le palette primaverili saranno sempre le mie preferite! Cara manco da troppo tempo! mi sono vista gli ultimi post, sei sempre troppo avanti!